Creating cocktails, or bartending, can be basic or intricate. Creating simple mixed drinks is easy, but mixing specialty martinis, combination shots and complex concoctions is more difficult. In addition to knowing what goes into each drink, it is important to be familiar with what liquors and mixers you offer at your bar so you know what drinks you can make. Fill a rocks glass with ice. Put as much ice into the glass as possible because liquors at room temperature will melt the ice quickly. Using too little ice will not only leave the drink warm, but also might make it taste too strong. Pour your liquor over the ice. Some bars use metered pour spouts, which ensure each portion will be equal. Other bars use open, or free, spouts that require you to count as you pour. A good rule of thumb is to hold the bottle away from the glass and count slowly to three to measure a shot. You can also wrap your first two fingers and thumb around the base of the glass and pour until the liquor reaches the top of your second finger to measure a shot. Fill the glass with your mixer. Once you add the liquor, fill the rest of the glass with soda, tonic, juice or any other mixer that the guest requests. Garnish the glass with a small mixing straw and a fruit wedge or cherry, depending on the drink. Most whiskey and dark liquor drinks are topped with a cherry, while most vodka and other clear liquor drinks are garnished with citrus. Pour a scoop of ice into your shaker. You only need enough ice to chill all the ingredients in the drink, but you should use enough ice so it does not all melt while you are shaking it. Add your liquor using either the count method or the metered pour. You won't be able to use the two-finger method since you usually can't see through the shakers. Add non-carbonated mixers. You can use any juice, cream, grenadine, fruit puree or sugar before you start shaking. Avoid adding champagne or soda because the carbonation will cause the lid of your shaker to pop off when you start shaking, possibly creating a mess. Pour the mixed drink from the shaker using a strainer. The easiest type of strainer is the type built in to the shaker. Remove the small cap and pour, and it will strain your drink. If your shaker does not have this type of strainer, place a flat strainer over the top of the shaker, hold it in place with your index finger while gripping the shaker with your thumb and the rest of your fingers and pour the contents into the glass. Add any carbonated mixer to the drink and garnish with the appropriate fruit. Place a shot glass on the bar. Bars use a variety of shot glasses, so it is important to know how many ounces your bar's shot glasses hold so you don't over-pour the shots. Your bar also might use larger glasses for double shots. Pour a shot of the appropriate liquor into the shot glass. Use the count method or the metered pours you used when making the mixed drinks to measure a single shot accurately. 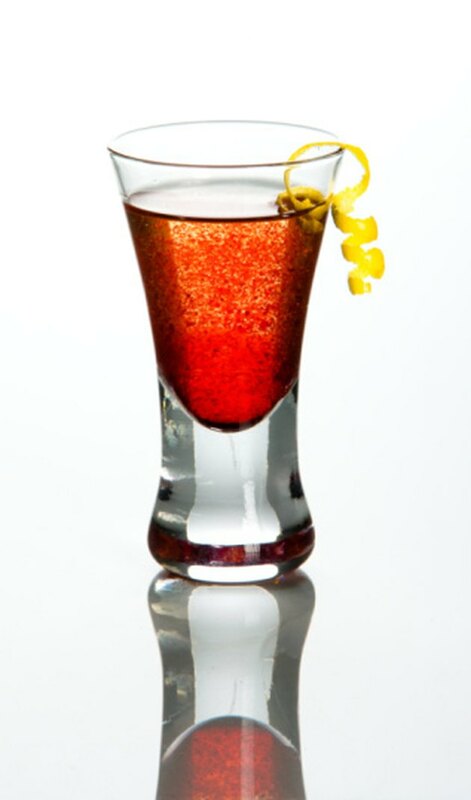 Serve the shot without any garnish, unless the guest requests one. Tequila is an exception, since shots usually come with salt and a lemon wedge. How Many Calories Per Shot of Gin? How Many Calories in a Shot of Jose Cuervo Tequila?